Chris Matthews, Neville Chamberlain, "appeasement," and Kevin James not knowing anything. 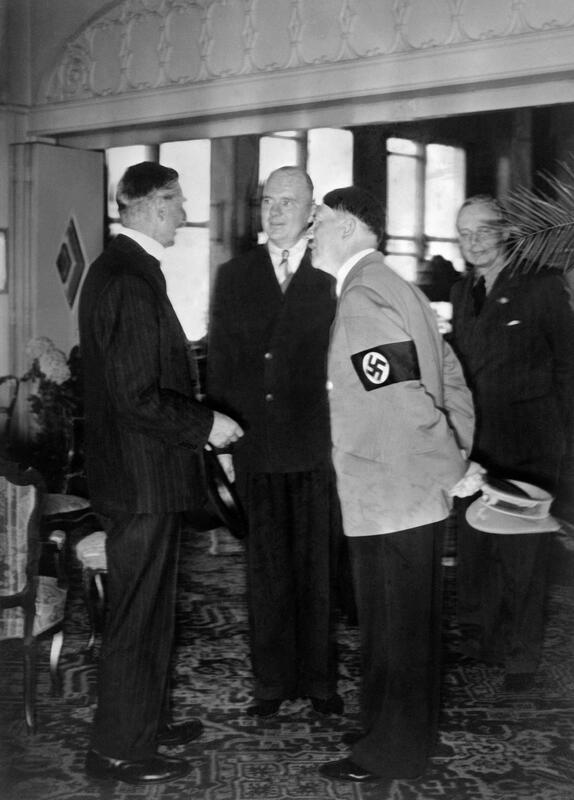 From left to right: Neville Chamberlain, a translator, and Barack Obama’s best friend (Hitler) in 1938. When a politician negotiates or suggests negotiating with a former enemy state, other politicians compare the first one to British prime minister Neville Chamberlain and the negotiations to Chamberlain’s “appeasement” of Hitler in the 1930s. That’s just the way things work. It took just hours, in fact, for Illinois senator Mark Kirk to dust off the ol’ Hitler playbook on Thursday in regards to the Obama administration’s announcement of progress in negotiations with Iran. It was so predictable that someone would use the Hitler analogy that Kirk’s comments are barely news, but they do present the opportunity to remember one of the greatest moments in comeuppance history. In 2008, Hardball host Chris Matthews realized that a right-wing guest named Kevin James—who’d come on the program to discuss candidate Obama’s alleged similarities to Chamberlain in regards to, again, Iran—did not seem to actually have any idea who Chamberlain was. Matthews exposed James for three grisly minutes. To James’ credit, he really sticks with it. To James’ discredit, he went on national television to talk about history without knowing anything about history. I’m not saying there aren’t left-wing or liberal clichés that are just as worthless. There are. But the Chamberlain-Hitler analogy needs to be taken into a bunker with Eva Braun and shot.